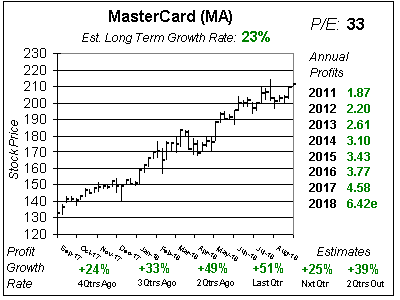 MasterCard (MA) continues to be richly priced. At 28x earnings, the stock is almost double its Estimated Long-Term Growth Rate (Est. LTG) of 15% a year. And really, the company isn’t growing profits at 15% right now anyway. Last year MA grew profits 11% and this year analysts expect just 6% growth. The company is experiencing double-digit volume and transaction growth, but foreign exchange is reducing these numbers. Also, MA gives up-front incentives to banks to garner new business and this hurts profits in the beginning of the deal while helping profits further out. This core stock is beloved by mutual fund managers who like long-term growth with large safe companies. Thus this stock has had a premium price since 2013 when profits grew 19% and the median P/E was 26. This year analysts predict just 6% profit growth, yet the stock sells for 28 times earnings. The last time the annual median P/E was 28 was in 2007 when profits jumped 68%. Also, between 2006 and 2012 the median P/E was in the high teens as profits grew an average of 25% a year. So in conclusion, this stock is richly priced, but is a good safe core holding with an Est. LTG of 15% a year which is high good for a high-caliber stock such as this. Profits have grown every year since the stock went public and management buys back stock in addition to paying a dividend of less than 1%. I would love to buy MA on a dip. Last qtr MA delivered sales and profit growth of 13%. The company beat the $0.90 by 6 cents, of which 3 cents was due to share repurchases. Analysts upped 2016 estimates from $3.54 to $3.63 and 2017 estimates from $4.14 to $4.20. This was the first time in at least a year MA’s estimates increased. Looking ahead, profit Estimates for the next 4 qtrs are 7%, 6%, 15% and 13%. MA is expected to get back to growing consistently in the double digits in 2017. It needs to with this 28 P/E. The stock’s right at its all-time high of $102 but I don’t think it has the power to break out and run higher. 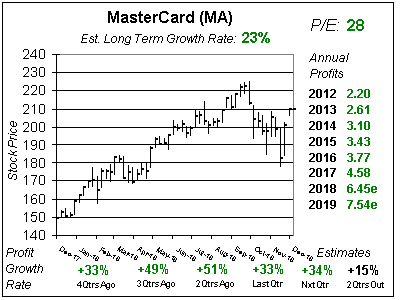 MasterCard was such a better value years ago, and I’m surprised the stock has a 28 P/E when profits are expected to climb just 6% this year. My Fair Value is 26x earnings which right now is $94 for this year and $109 for next year. MasterCard is a solid buy-and-hold stock that would fit-the-mold for most stock investors. The company is a juggernaut in its field and gives investors exposure to the Financial sector without having to buy a bank with meh profit growth. The company has grown profits each and every year since going public, pays a dividend, and buys back stock. Profits are being hampered by a strong USD and incentives paid our for new business, but profits look to rebound to the mid double-digits by next year as foreign exchange headwinds dissipate. MA is on my radar, and I will look to add to both growth and conservative accounts if it falls.